BAKERSFIELD, Calif. — It's a story 23ABC first brought you back in October of an East High trainer Billy Toledo who claimed Kern High School District (KHSD) and the East High School Athletic Department was allowing ineligible students to play sports. Monday night, Billy Toledo spoke in front of the Kern High School District board of Trustees pushing once again for a closed door session about the issues months later. "I'm just here tonight to make sure that my request for a spot in March's closed session would be granted," Toledo said to board Monday night. However, while we were working to air Billy Toledo's original story in October, he contacted 23ABC News saying he believes staff members were retaliating against him, trying to get him fired. He said they were spreading rumors, that he was having inappropriate relations with a female student. A week before our story aired, on October 20, Toledo sent 23ABC News an email that said, "Yesterday an older female teacher asked to speak with me and told me another staff member told her I am messing around with female students." Toledo went on to say in his email that the staff member told him quote, "be careful because she believes they are trying to get me fired." Meanwhile, right after Toledo addressed the board on Monday night about getting his closed door meeting a parent spoke out against the alleged rumor about an inappropriate relationship that took place between her daughter and Toledo, "This back and fourth between Mr. Toledo and East High was an ongoing thing. On or around October 18, a teacher mentioned Billy and a 17-year-old student were supposedly engaged in an inappropriate relationship or at best an inappropriate act." Lisa Clark a mother of the East High School student. Clark claims the staff knew about the rumor and let it circulate on campus for a month until one staff member allegedly formally reported it in November, "The staff didn't stop the rumor in it's tracks for months it wasn't until a coach at the school decided it was her duty to report the claim. A coach, a female coach was disturbed and disgusted enough to report the rumor and have an investigation done to see if this was indeed a rumor or a sickening truth," Clark said. According to Clark it wasn't until the end of November that she was contacted by the Dean of Students and told that there was an investigation into the matter, "I received a call from Pam Crane in November, late November with regard to this rumor because that young student... the one whose name was dragged through the mud by the staff, shes my daughter," Clark said. The district confirmed to 23ABC News there is an investigation into allegations of misbehavior at East High .. but they could not comment any further because it is an on going investigation. According to Clark her daughter denies ever having any inappropriate contact with Toledo and because of the alleged rumor Clark eventually pulled her daughter out of the school, "Even after the student was pulled from school it continued, after she was put in independent study and saw her doctor for her anxiety and was prescribed an antidepressant it continued, after she lost 20 pounds it continued and sent to see a therapist.. the rumors continued," Clark said. 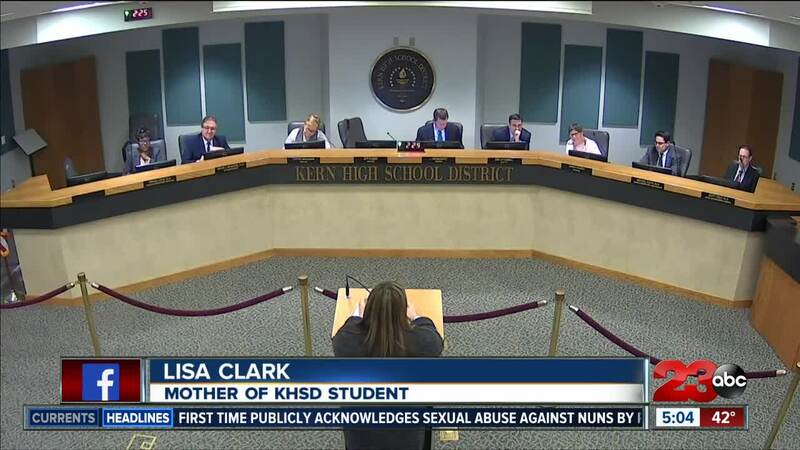 Clark is now also requesting a closed session meeting with the Kern High School District board to address the process in place to combat rumors surrounding molestation rumors and accusations.